At a wine bar in San Francisco on Wednesday, Broadcom Chairman and CTO Henry Samueli delivered some sobering news: Moore's Law isn't making chips cheaper anymore. The famed law of microprocessors predicts that packing more transistors onto a silicon wafer will make processors smaller, faster and cheaper with each generation. The ability to get more chips out of each wafer should cut the cost per transistor with each new generation, according to the logic of the law, which was first proposed by Intel co-founder Gordon Moore in the 1960s. But keeping Moore's Law going now requires complicated manufacturing techniques that are so expensive they cancel out the cost savings that should come with each new generation, said Samueli, who co-founded the giant communications chip maker in 1991. 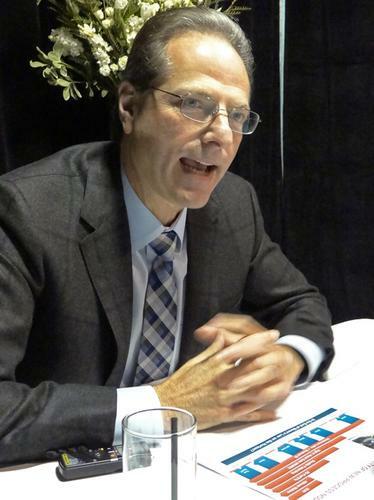 "The cost curves are kind of getting flat," Samueli told reporters at an evening Broadcom event at the Tank18 wine bar in San Francisco's trendy South of Market district. Instead of getting more speed, less power consumption and lower cost with each generation, chip makers now have to choose two out of three. He pointed to new techniques such as High-K Metal Gate and FinFET, which have been used in recent years to achieve new so-called process nodes. The most advanced process node on the market, defined by the size of the features on a chip, is due to reach 14 nanometers next year. At levels like that, chip makers need more than traditional manufacturing techniques to achieve the high density, Samueli said. The more dense chips get, the more expensive it will be to make them, he said. Process nodes themselves still have room to advance, but they may also be headed for a wall in about 15 years, Samueli said. After another three generations or so, chips will probably reach 5nm, and at that point there will be only 10 atoms from the beginning to the end of each transistor gate, he said. Beyond that, further advances may be impossible. "You can't build a transistor with one atom," Samueli said. There's no obvious path forward at that point, either. "As of yet, we have not seen a viable replacement for the CMOS transistor as we've known it for the last 50 years." But the impact of cost increases will come sooner, he said. For some types of processors, chip makers will probably stick with current process nodes. They'll only invest in more dense geometries for chips that have to meet growing performance and power-consumption requirements at any cost, Samueli said. This has already happened in the world of analog chips, where manufacturers still use technology that's five years old or more and innovate instead on design, he said. While some of the network switch chips Broadcom makes, for example, will demand new process nodes, many processors in consumer devices probably won't, he said. "You don't need to build a Wi-Fi chip in 10nm CMOS. You can do it just fine in 28nm." Where consumer devices do need newer chip technology to maximize battery life, the ongoing bargain of getting more for less eventually will end, Samueli said. "We've been spoiled by these devices getting cheaper and cheaper and cheaper in every generation. We're just going to have to live with prices leveling off," he said. If that means consumers replace their smartphones less often, it still doesn't spell gloom for the device business, according to Samueli. Someone who waits an extra year to upgrade a phone will find something else to buy, such as a smart watch, he said. There has been sticker shock for some chip makers recently in connection with the introduction of FinFET technology, which stacks transistors on top of each other, according to Nathan Brookwood, principal analyst at Insight64. Intel took the lead on FinFET and has been able to shrink transistors while using it, thereby getting cost savings. But TSMC and GlobalFoundries, two major foundries that serve chip design companies like Broadcom, had to freeze the size of their transistors while they adopted FinFET. For the next generation of processors, the cost curve should come back to normal, Brookwood said. Still, the challenge of advancing technology past about 5nm remains, he said. "We have a lot of problems at that point," Brookwood said. The good news is that there's no shortage of motivation for engineers to find a solution. "If they can't find a way, this whole train comes to a crashing halt."